Free Yolato Day is a Scam!!! Apparently Yolato, and their PR dept’s definition of “Free Yolato” is something entirely different than my definition. Free Yolato means that you are not charging money for Yolato… And yet today, I arrived at Yolato to find the cash registers up and running, and a Midtown Lunch reader being charged $4 for her order. I guess Free Yolato to them means tiny cups of plain Yolato, being handed out on the sidewalk in front of the store. I can get a free sample of Yolato at any location in the city, just by walking in and asking for it. How is this a “Grand Opening Celebration”??? When free food is your favorite thing in the universe, being denied a full serving of promised free food after walking 15 minutes expecting free food makes Zach a very unhappy fat man. The Midtown Lunch boycott of Yolato has officially begun. I demand satsifaction! Posted by Zach Brooks at 1:09 pm, November 14th, 2007 under Uncategorized. I just stopped into Yolato after lunch and they had the free plain yogurt samples at the door but I just walked past the server and went to the counter and asked for a free sample of the Ferrero Rocher. They gave it to me in the tiny cup, however, my co-worker asked for a free sample of Cookies & Cream and he received it on the little orange spoon. So, I’m not sure how they determine who gets cups and who gets spoons but either way, it was good. I am up for that type of ban–I made a 15 minute detour to get the “free” Yolato and it turns out there wasn’t any. What a scam (I did try the free samples, though and while they were good its not like I’d walk out of my way to pay $5 for a cup). I’m mad as hell and I’m not gonna take it anymore! Dishes has raised all of their prices but not updated the menu boards or price signs. Some of the boards make reference to new fall pricing, but it’s been about a month and somehow they still haven’t been able to fix the listed prices. I was expecting to pay $3.25 for a piece of cake labeled $3.25. When the receipt said $3.75, and I was told that it was the new pricing. How is it that they are able to pump out about 50 different buffet dishes, 30 baked goods and countless other products each day, but for a month they cannot update the posted prices. This must be a violation of a consumer protection law. is it time for a class action suit for all of the defrauded customers? It is I… your friend that spent $4 for a small cup of Yolato (or as I now call it… yo-pay-too-much). I like the Yolato in the West Village, but this Yolato sure has been ‘midtowned’. After enjoying my overpriced frozen treat, I am boycotting! I WILL NOT END MY BOYCOTT UNTIL MIDTOWNLUNCH READERS GET THE FREE YOLATO THAT WE DESERVE!!!! I walked 20 min crosstown for “free yolato”. =( I enjoy it more than Pinkberry because of the Nutella topping but alas it failed me today. I went by and the place was busy. Girl outside gave mini cups of fro yo. 2 flavors, I liked the blackberry. Inside I could taste whatever I wanted. Aloe vera. Hmm, scary but kind of good. Where’s the scam – I’m confused. alas, i too was a victim of this free yolato hustle. i must have been one of several midtown lunch readers who asked the sample lady, “wait, is THIS the free yogurt they’re giving out today??!! !1!” while holding the teeny ketchup-cup in my hand. 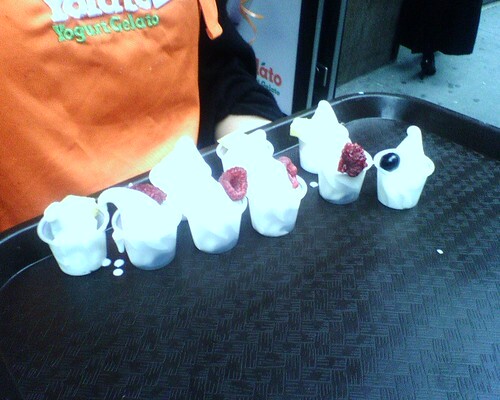 and yes, it was good (very pinkberry-esque), but i was NOT going to pay for any yolato after that. i don’t know if i’ll be disciplined enough to boycott it forever, but that really is crappy advertising. free samples are a given. this is just one more reason to avoid snacks like the plague, and simply order a mammoth lunch from el rincon del sabor every day. Nate, what is the best day to visit el rincon? I’ve been meaning to go for a while, but have not yet made it, and I understand their specials vary by the day. thankfully i only work a block away so seeing the girl with the mini cups wasn’t too dreadful. we should’ve had a midtownlunch yolato meet up and then we could’ve all protested together! I walked 45 minutes uptown to get my free Yolato!!!!!!! To my absolute horror, I was informed that free meant this mind-numbing little pimple of a cup with plain disgusting “yogurt”. There weren’t enough calories to cover my 50 block journey, nor were there enough yogurt cultures to stave off the bacteria my body incurred. I feel 100% stripped of my human dignity. This is inhumane! We are not prey to inconsiderate Yolato management. Yes, let’s boycott! I also think we should picket the place at lunch and see if we can get one of those inflatable rats to show up at the front door. I am also willing to handcuff myself to the front door in a Pinkberry shirt and be sprayed with dairy free whipped cream. I agree! This is unacceptable. I went really far, and to make up for it, i had take little cups from the sample guy 5 separate times to feel like I got anything! No more Yolato LIES! What kind of pathetic losers walk 10 blocks to get free yogurt? Get a life people. You’re lucky you have jobs – a recession’s a coming. Curious ones, interested to try new things. A much superior breed than those who surf new websites to find new people to insult.